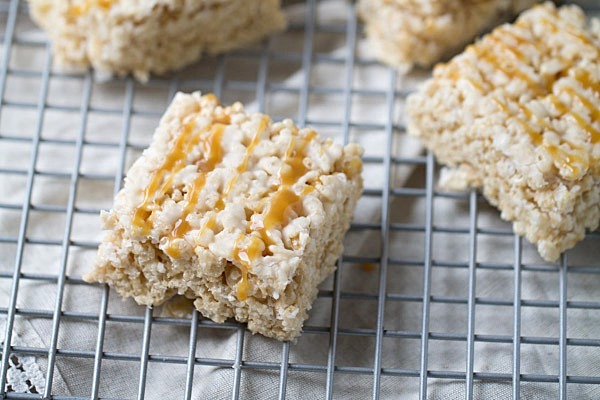 Stuff your face with these crazy good Caramel Macchiato Krispie Treats. Caramel Macchiatos are like whoa. But alas, as much as I L-O-V-E Starbucks, I cannot go there everyday. I had to cut back to once a week so I could save more money. Darn you, Starbucks. Why you be so expensive? Making coffee at home is very economical. The money you spend on a pot of coffee or a box of K-Cups goes a lot further than one latte from a coffee shop. You can make your home-brewed coffee great by using Coffee-mate coffee creamers! Coffee-mate has a great selection of lactose free coffee creamers, including Classic Vanilla and French Vanilla flavors. Homemade caramel macchiatos can be whipped up in minutes by adding one of the Coffee-mate vanilla creamers to your coffee. Top it off with a drizzle of caramel syrup. Coffee-mate is also great in recipes! So today we’re gonna talk about making sweet treats with Coffee-mate creamers. I big puffy heart using Coffee-mate creamers in my sweet treat recipes. I used the Pumpkin Spice creamer in these Pumpkin Spice Gooey Magic Bars and this Coffee Creamer French Toast, two Fall favs. You can use the creamers to make ice cream, frosting, cookies, milkshakes, cheesecakes and blondies. The possibilities are almost endless if you let your creativity soar. 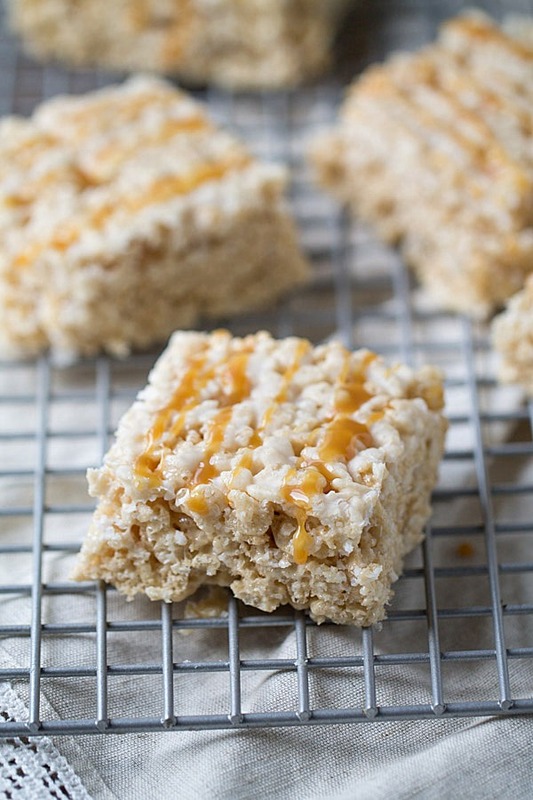 My love of caramel macchiatos inspired me to make these Caramel Macchiato Krispie Treats. Any caramel macchiato fan knows that they are made by mixing vanilla syrup with espresso and adding steamed milk. The final touch is a drizzle of rich caramel sauce. To make these no bake krispie treats, I mixed French Vanilla coffee creamer, coffee extract, butter and melted marshmallows together. I mixed in crispy rice cereal and then pressed into a 9×9 pan. Think of the krispie mix as the base of the caramel macchiato. I cut the krispie treats into squares and then drizzled them with salted caramel sauce. Think of the salted caramel drizzle as the same drizzle that tops your macchiato. Line a 9x9 baking dish with aluminum foil. Be sure to use enough to hang over the sides of the dish for easy removal of the krispie treats from the dish. Spray with cooking spray and remove excess cooking spray with a paper towel. In a large pot over medium heat, melt the butter. Whick in the ¼ C coffee creamer. Add the marshmallows and continually stir until melted. Remove from heat and stir in the coffee extract. Fold in the crispy rice cereal and then lightly press into the baking dish. Make the glaze by whisking together the confectioners sugar and 3 tbsp coffee creamer. Spread evenly over the top of the krispie treats. Allow to set until firm. Remove the krispie treats from the dish by pulling up on the foil. Cut into 9 squares and then drizzle with caramel sauce. 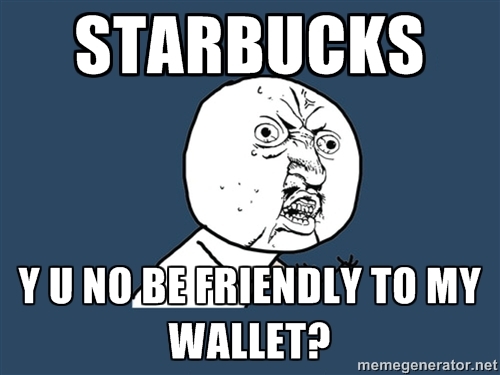 Yes my addiction to Starbucks is expensive for my wallet! Especially with the Fall coming and holiday season. Love these treats with the caramel and macchiato!!! You are a genius!! OMG, The fall season brings PUMPKIN SPICE LATTES. Yes! I cannot wait, although, I do not drink to many of them. WAY too much sugar! Thanks for stopping by, Zainab! Looks great, Julie. I’ve never been to Starbucks, I mean, I’ve been to meetings there, but never bought anything from them. I hate spending money on food out, but I’ll spend crazy money on clothes just not food, but is ironic since I’m a food blogger. Haha, I spend WAY too much money on food. It’s probably good you’ve never had Starbucks. You may become addicted! True story – I used to hate coffee. Then Ken introduced me to Starbucks. Now I can’t get enough and I even like regular ole brewed or K cup coffee! Oh, Starbucks, one of my weaknesses! I definitely agree that it is more cost effective to make coffee at home, especially if you are enjoying it with one of these Krispie Treats. These look like the perfect afternoon snack! The glaze looks like the best part. Julie, These look amazing. What a great twist on the traditional treat! 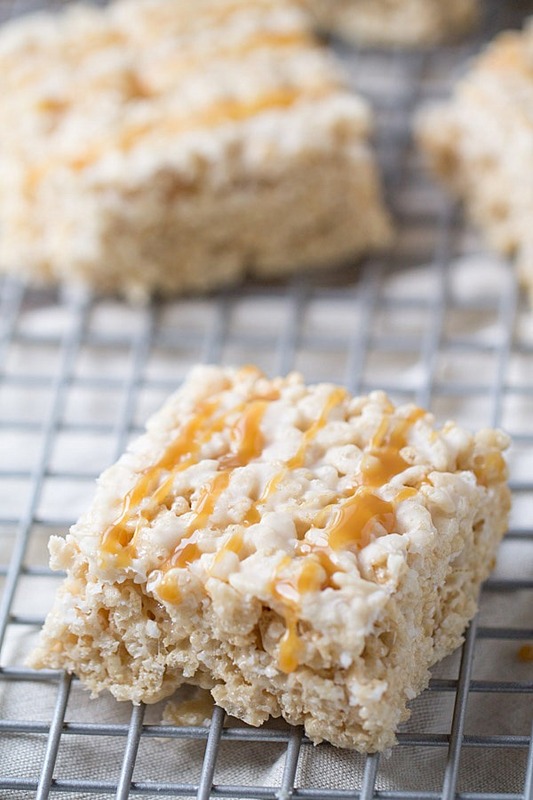 Did someone say rice Krispy treats?! Also, did you add caramel & French vanilla creamer in these?! Well done! I’m drooling a little. Yes, yes I did! Glad you are enjoying this recipe. They are drool-worthy! Starbucks is definitely one of my weaknesses especially when pumpkin and peppermint start rolling out. I love caramel macchiato too and adding coffee creamer to Rice Krispies is such a fantastic and tasty idea! These look amazing, Julie and I can’t stop drooling over that glaze! Oh did you hear that pumpkin spice will be out early this year? I heard at the end of this month. You can guarantee that I will be at Starbucks the day it comes out! Thanks for stopping by, Kelly. Hope you have a great week! Great idea Julie!! You have really raised the bar on the traditional krispie treat! Yum! Oh my goodness! I LOVE these, Julie! 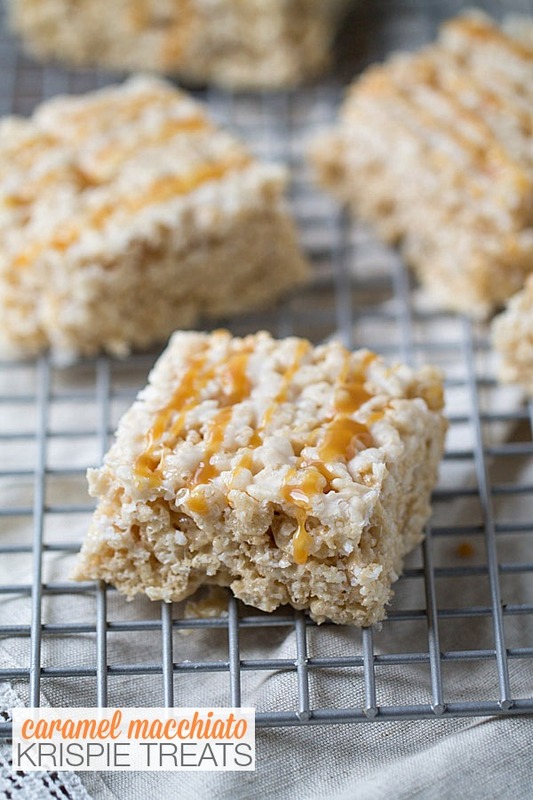 :) What a great adult twist on krispie treats! I can just walk into Starbucks, and they make my order…I don’t have to say a word! I had no idea that Coffee Mate had lactose-free creamers, that is so cool. :) I will have to check those out! Wow, that’s awesome, Lisa! I have so many Starbucks around my house and in the area that I live in that I’m not always at the same one. LOL! And yep, all of the Coffeemate creamers are lactaid free. :) WIN! Thank you, Consuelo! Hope you have a great week! Yep, I think you have outsmarted Starbucks. I love the poster. Sooooo true. One of the reasons I like working at my current day job is that once a week the boss buys the office mochas and lattes. A wonderful perk—of course. For some reason rice krispie treats are always popular. Moms like them of course because they are so dang easy. Now we get rewarded flavor wise too. Now free lattes from the boss is a pretty sweet deal! You know, I don’t know why I don’t make krispie treats more often. They *are* so easy to make. Maybe I will make more soon! Thanks for stopping by, Carol. Hope you have a great week! Imagine converting your $ to Euros… it’s totally heartbreaking to pay 8 dollars for a coffee :/ but I totally get you! And these look awesomesauce.